Time to get our Friday Foodie Fix with this week’s Secret Ingredient –Garlic! I love garlic and could use it with every dinner. I however have to limit it to my four-day rotation in order for it not to upset my delicate digestive system. Have you ever added fresh garlic to a recipe and thought, wow this is stronger than the last time I cooked this recipe? Maybe you were using two different types of garlic. 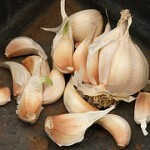 Mexican or Italian garlic, which has a pink color on it’s skin, is more mild than white California garlic. This will make a difference in how your dishes taste. If you’ve also used elephant garlic in place of regular garlic I thought you might want to know, it’s not really garlic but a leek. It does have cloves just like bulbs of garlic and it has that name. Food can be confusing. Do you have a favorite garlic for Friday Foodie Fix? Recently on the market is Black Garlic. Scott Kim began developing the product in South Korea in 2004. Along with John Yi, they started the company Black Garlic, Inc. Right now you can find their product in the San Francisco Bay area and it can be shipped from a few distributors. Information is on their website. 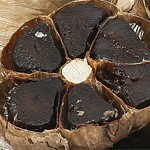 Black Garlic is fermented garlic by using a special roasting process that takes a month to develop. There is nothing added to the garlic. ** Have read elsewhere they soak the garlic in soy sauce which would mean it’s not gluten free. Got confirmation from Black Garlic, Inc. there is no soy sauce in their black garlic. It is 100% natural and ZERO additives. 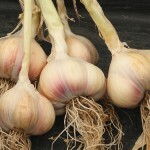 ** The cloves are soft enough to spread and many top chefs are starting to use this ingredient. Please let me know if you have tried it. I’ve ordered some and can’t wait to give it a try. Here are a few of my favorite recipes with garlic for Friday Foodie Fix. How about you? Do you eat lots of garlic? It’s really good for you. Please share your recipes using garlic here with Mr. Linky. He’s very easy to use. All you need to do is add the name of your blog and title of the recipe, then the next line requires the URL for that recipe. Next click enter and you’ve just added the link to your recipe. Read this for more details on the rules. My challenge to the foodie world is to get at least 30 recipes here that include garlic. So are you up for this? Can you help? Add yours and then tell others to come and add their recipes. Let’s see how much we love garlic. Next week’s Secret Ingredient is …………………Shrimp! Your tomatillo salsa looks delicious, as do your other recipes. Looking forward to seeing what other garlic recipes show up. I love garlic. I use a lot of garlic in cooking…the recipe I posted, Crockpot Garlic Chicken, uses 20 to 40 cloves of garlic, but isn't strong at all because of the long cooking time. I use a lot of garlic in cooking…the recipe I posted, Crockpot Garlic Chicken, uses 20 to 40 cloves of garlic, but isn’t strong at all because of the long cooking time. I love garlic. cook with it as much as I can. wow, never heard of black garlic – will have to be on the look out for it. thanks for all the great information. This is such a good idea. I've found some new blogs to visit, some good recipes, and a new cookbook to buy. Thanks. This is such a good idea. I’ve found some new blogs to visit, some good recipes, and a new cookbook to buy. Thanks. Wow, sorry I'm so behind on reading. Love all the comments. Heather- I just made the tomatillo salsa again. Love it silly. I hope you check out all the great recipes people have shared. JoAnn- Love chicken with 40 cloves of garlic but my friends don't like it as much. Switch2glutenfree- Girl you are talking my language. I love Buffalo wings. Celiac tips- Let me know if you give it a try. Waiting on mine to arrive. 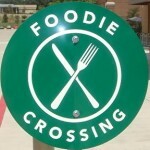 Wendy- I'm glad you're enjoying the Friday Foodie Fix posts. I agree, people are sharing great recipes. Shirley- I know. I took off too and see what grew. Having so much fun with what people are sharing. You know I'm a huge shrimp fan so I can't wait to see what is here next week! Desmone- Do I mind, I'd love it. Thanks for finding me and for the garlic recipe. I added the widget. Very cool how that works. I really enjoyed the International Food Bloggers Conference via the web. Hope to catch the next one. I heard the goodie bags were amazing too. I hope you'll join in on Friday Foodie Fix again. Wow, sorry I’m so behind on reading. Love all the comments. JoAnn- Love chicken with 40 cloves of garlic but my friends don’t like it as much. Wendy- I’m glad you’re enjoying the Friday Foodie Fix posts. I agree, people are sharing great recipes. Shirley- I know. I took off too and see what grew. Having so much fun with what people are sharing. You know I’m a huge shrimp fan so I can’t wait to see what is here next week! Desmone- Do I mind, I’d love it. Thanks for finding me and for the garlic recipe. I added the widget. Very cool how that works. I really enjoyed the International Food Bloggers Conference via the web. Hope to catch the next one. I heard the goodie bags were amazing too. I hope you’ll join in on Friday Foodie Fix again. Yes the goodie bags were truly amazing. I'm glad you could tune in via the web. Seems like it was over too fast! I'd love to participate in Friday Foodie Fix again. Cheers! Yes the goodie bags were truly amazing. I’m glad you could tune in via the web. Seems like it was over too fast! I’d love to participate in Friday Foodie Fix again. Cheers!